Listen again to the Songs of Hope program put to air on 28 December 2014. Its our last program for the year. Lots of music included, a few carols, plus the story of Eva Burrows. Eva, an Australian, became world head of the Salvation Army for a few years. 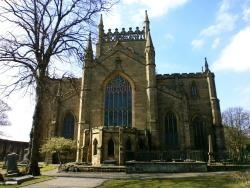 The church above is Dunfermline Abbey in Fife Scotland, and was founded in 1072.